The improvement in Trump’s popularity doesn’t mean Republican lawmakers shouldn’t be concerned about the midterm elections, Lichtman noted. “I don’t think there’s much that can happen between now and November that’s going to dampen the enthusiasm of the anti-Trump vote,” he said. Eric Ostermeier, a research fellow at the University of Minnesota’s Humphrey School of Public Affairs, said in a Feb. 5 email that Trump’s numbers are “still dangerously low” nine months out from the midterm, a time when voters historically have tended to cast their ballots against the governing status quo. “Any momentum he might be experiencing now could easily be derailed by a downturn in the economic and financial indicators on which he has hung his hat,” he said. Ostermeier and Lichtman also cited as possible Trump-related risk factors for the GOP any potentially unfavorable developments from special counsel Robert Mueller’s Russia investigation and the president’s penchant for controversial statements. Asked how the GOP plans to maintain its control of both chambers, Republican National Committee press secretary Cassie Smedile noted the public’s improving perceptions of the tax bill and the RNC’s fundraising advantage over the Democratic National Committee. Federal Election Commission data shows the RNC outraised the DNC by a roughly 2-to-1 margin in 2017 and the first month of 2018, and it has approximately six times as much cash on hand as its Democratic counterpart. Trump retains support from a majority of voters in 16 states — all of which he carried in the 2016 presidential election — while most voters in 21 states disapprove of his job performance. Among the other 13 states: five have a plurality of disapproval, three have a plurality of approval, and five states are split. The president has improved his net rating in 20 states since the most recent data from Morning Consult’s previous release in October, which included data from Trump’s Jan. 20, 2017, inauguration to Sept. 26. In eight states, voters have soured on him. For Senate Republicans, the new data points to some cause for optimism as they seek to build on their 51-49 majority in the chamber by protecting seats in two Western states and targeting Democratic incumbents in 10 states Trump carried in 2016. 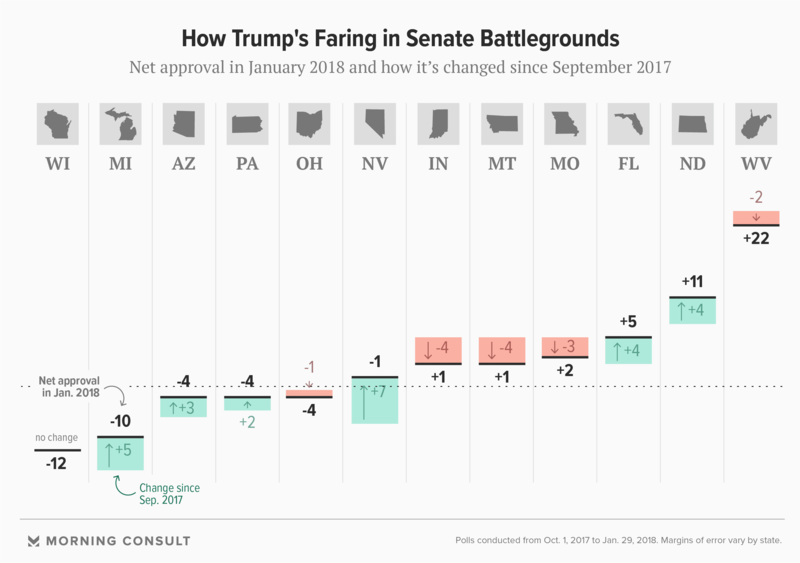 Trump has improved on his standing in Nevada (+7 percentage points) and Arizona (+3 points), two states Senate Democrats consider ripe targets. In January, Nevada voters were split on Trump’s job performance ahead of Republican Sen. Dean Heller’s re-election run; in nearby Arizona, where Rep. Kyrsten Sinema (D-Ariz.) is hoping to flip the seat left vacant by retiring GOP Sen. Jeff Flake, Trump is 4 points away from pulling even. 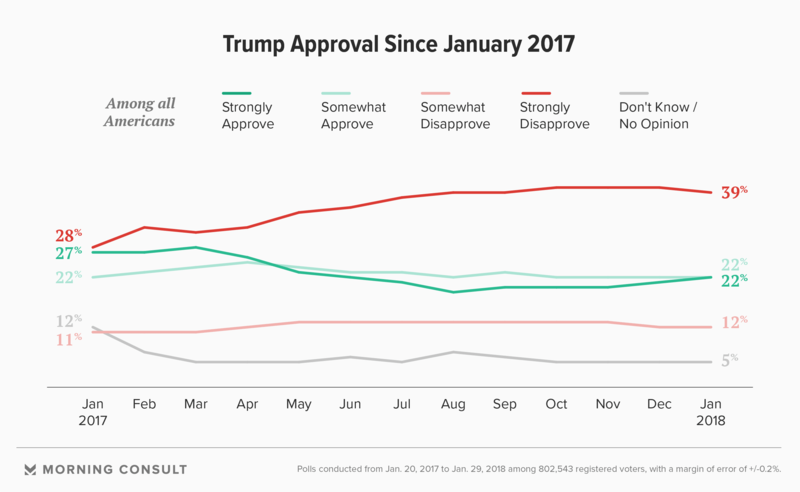 The president also remains popular in West Virginia and North Dakota, with a strong majority of voters approving of his job performance there. Sens. Heidi Heitkamp (D-N.D.) and Joe Manchin (D-W.Va.) have spent much of this election cycle touting their willingness to cross the aisle to work with Trump and earn results for their constituents. 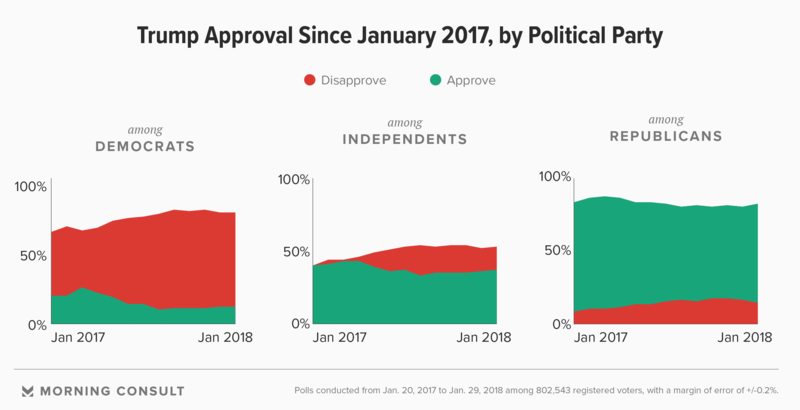 Even in Trump-won states where the president’s approval ratings have been trending downward over the past few months, Democratic incumbents are employing a similar strategy. Sens. Tammy Baldwin of Wisconsin, where a majority of voters disapprove of the president, and Joe Donnelly of Indiana, where voters are roughly split, have touted their protectionist stances on trade and manufacturing — an integral part of the president’s message. And in Missouri, where a plurality approves of the president, Democratic Sen. Claire McCaskill continues to highlight her bipartisan efforts. The White House did not respond to a request for comment on the president’s approval ratings or questions about his strategy for the midterms. Correction: A previous version of this story misstated the date range in which Morning Consult surveys were conducted.